Is it possible to simulate realistic military combat scenarios that attempt to combine intense first person shooter action with team-mate tactics based gameplay? That middle ground is what people in the game industry refer to as Tactical Shooter. Combining elements of FPS gameplay with those of real time strategy is a daunting task. Likely to impress many fans if the formula succeeds. Likely to lose many more if it doesn’t. In an FPS market that’s dominated by “soloist” shooters such as Halo, Call of Duty, Medal of Honor and Half Life, developers will need to think cleverly about how to implement these elements to help the game sell. 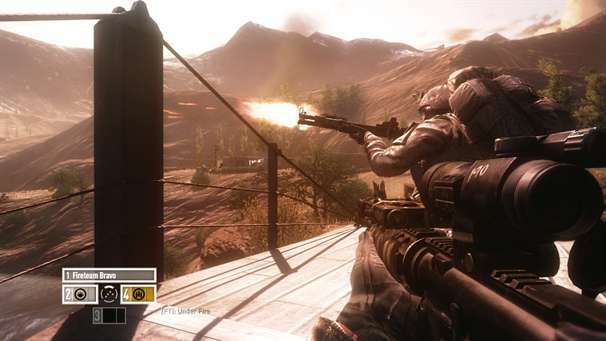 Operation Flashpoint: Red River is the latest installment in the Tactical Shooter series developed and produced by Code masters. Does the game deliver on what the genre promises? The story opens with a rather strangely egotistical wrap-up of America’s presence in the middle east for the past 40 odd years. The introductory video is basically a slide-show of major events, such as the gulf war, 9/11, and the crushing of Saddam Hussein’s regime. Additionally, given recent events, what I found particularly funny while starting up was the consistent mentioning of how the US forces are still looking for Osama Bin Laden whose “still holed up in some cave somewhere”. The video also provides some background information to the current state of the middle-east campaign, and how the Chinese are subsequently dealing with their own extremist problems. However, again, I do have to stress the HIGHLY egotistical nature of the soldier’s rant. There’s a difference between being patriotic, and being downright insolent. Either way, it still achieves the purpose of outlining what players need to know in regards to the plot. In looking at the story, I have to admit that it’s nothing too original to the gaming industry. One fallback that I find with many first person shooters these days is the fact that many games involving America and a war tend to sensationalize the idea of going into battle with the same old enemies. If it’s not an enemy from the middle-east, then it’s China or North Korea. If not them, then guerrilla groups in Africa, or armies from Russia or Germany. While the shift in enemies about halfway through the game keeps the story kind of fresh, it’s something we’ve all tasted before. While it is a daunting task to face off against the might of one of the largest militant countries on Earth, it still follows the age old “struggling and succeeding against impossible odds” storyline we’re used to seeing, coupled with the “brotherhood of soldiers” subplot that evolves as your unit integrates more closely with other teams. Understandably, in attempting to create an accurate simulation of modern day warfare situations, creativity in story is limited to an extent. My point is, to those who play this game, story-wise, don’t expect anything too original. Red River’s predecessor: Dragon Rising, which was released in 2009 had a myriad of problems gameplay and story wise that was met with pretty harsh scrutiny by the wider gaming community. A barely relate-able plot coupled with an overly busy HUD screen, complicated control systems and a downright stupid AI system brought down the experience for a lot of people. Having said that, it’s nice to see that Red River has attempted to rectify some of those problems. However, the keyword in this sentence is: “ATTEMPTED”. By all means, the game is a good deal more playable than the previous installment, but it still features a number of similar problems. Minor annoyances on their own, but frustrating when complied. One surprising addition to the gameplay was the introduction of an in campaign experience system. By executing certain orders, and making kills in certain ways (for instance, headshots and multiple rapid kills) the player character accumulates XP to put towards additional skills and upgrades not only to the soldiers themselves, but also their weapons and equipment. 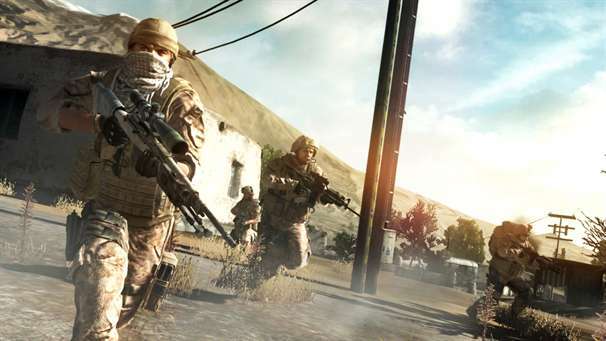 Similar to the way in which Call of Duty implements an experience system in competitive multiplayer, XP gains in campaign mode reap some serious advantages, including enhanced precision and enhanced battlefield and radar awareness. Having said that, point allocation should be considered carefully. Different classes benefit better from different upgrades. If you tend to play the role of sniper in your group, unlocking advanced explosives may not be the best idea. One of the issues involved with the XP system is that the game assumes that the player will be capable of making a majority of the kills to rake in a majority of the XP to upgrade. With each level successively increasing in difficulty, and enemy AI increasing in general viciousness, players who are unable to nail a substantial number of enemies in previous engagements will find themselves at a disadvantage at later stages. In this sense, the allied unit AI is perhaps a little TOO smart. During the first few engagements of the game, I found that I was only able to kill a minority of the enemy units, while the allied AI squads and team-mates dealt with the rest. While I was happy to receive the fire support, it also meant I was unable to obtain some much needed extra XP for a then-essential precision upgrade. To put it simply, the AI downright steals your much needed kills. Never thought I’d be yelling “kill-thief” at the game itself. Happens in Left 4 Dead however. Seems to be a trend in co-op oriented games. The issue is that the kill stealing will actually have a negative effect on your game, besides the damage to player ego. Many players will get a little frustrated at how little of the action they see in opening levels. Admittedly, it did put me off to a degree, and set a slightly sour mood as I progressed through later levels. One major complaint and area that I found had not been improved over the previous game was the cluttering of the Heads Up Display. Even looking at the sample HUD in the manual does not make gameplay look appealing. The HUD has too much going on at once. While this may be less of an issue for PC gamers who are able to hotkey many of the on-screen functions to suit their play-style, for console gamers, the HUD is just one big ugly mess. While it’s understandable that Codemasters wanted every asset to be known to the player, so many items on the one screen can really confuse the heck out of players. 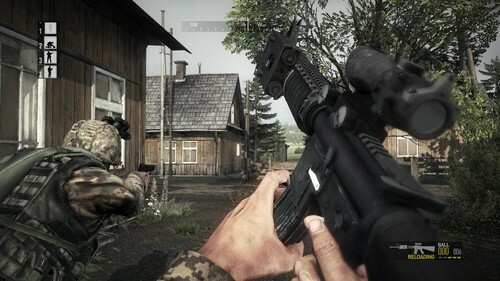 The worst of all is when you have to bring up the “team command” function to give orders to your AI teammates, which take up a large majority of the player’s central sight, including the targeting cross-hair. Attempting to give specific orders to your fellow squad members while in the heat of battle is not an easy task. While it’s probably accurate to the working conditions of many of our fine soldiers, it does not make for a pleasant gameplay experience. It’s made all the more worse by how easily your soldier can be wounded and even killed by a few wayward gunshots. While certain elements are pretty self explanatory, like the radar, compass and equipped weapon slots, other aspects will really begin to make the player feel over-encumber visually. Of particular nuisance are the Rendezvous markers, team objective markers, personal objective markers, team chatter, bleed meter and even the score counter. That said, these features do not make the game unplayable. In fact, when you are able to correctly execute a brilliant team tactical maneuver, it’s all the more sweeter. However, this combination of slight annoyances will take even the most seasoned of gamers time to adjust to. As for explaining controls, most of the functions are pretty self explanatory, and your standard fare for first person shooters. However, the large number of functions that are available in the game can only be activated by use of “hold” functionalities on certain buttons. For instance, In a long range firefight, I may wish to swap my weapon’s firing mode from burst, to single shot. To do so, I must hold down the X button, which consequently also serves as the reload function. If playing through so many rounds of online FPS gaming has taught me anything, it’s that some gamers aren’t a patient bunch. The notion of having to hold down a button with different functionalities will undoubtedly seem painful. Additionally, the ever pain staking command radial (which comprises the “tactics” part of “tactical shooter”) must be navigated by use of the D-pad. Having to interchange between D-Pad and Left control stick will seriously disrupt the players flow of gameplay, and immersion within the game will be lost to a degree. The gameplay however is not all doom and gloom. As previously stated, Red River is a SIGNIFICANT improvement on Dragon Rising. The AI’s of both enemy and allied soldiers is significantly more balanced than that of the previous installment, with allied AI’s able to take their own initiative to take down enemy targets or protect certain key assets. However, this new AI scheme seems to be mixed in its effectiveness. While they are able to fight and take cover with a reasonable degree of effectiveness, movement control can be a huge pain in the hind quarters. For instance, when our entire 4 man squad was pinned down behind in a small building by enemy gunfire, I seemed to be the only one attempting to fight back. The other three were out of the line of fire, but just seemed to be standing around, enjoying their little desert outing. Once we got out in the open though, things got really weird. While naturally, my character became a magnet for enemy bullets, all three of my teammates were able to nail a majority of our enemies at range before they did me any real serious damage. For some reason, the AI is able to excel at long range combat, but struggles in tight quarters. Bear in mind however that you will only really need to worry about command functions and allied AI in a single player game. Prospective players should note that Red river DOES support up to 4 player co-op, either online or via system link. As a result, gameplay elements are likely to experience a significant change, the most particular of which is the elimination of fears regarding AI action as well as losing the need for the tactical command radial. If nothing else this proves that Red River is in a league similar to that of Left 4 Dead and Borderlands, in that it is a significantly different game to play as a group as opposed to alone. So if you want to try it for REAL, get a few mates together with a few copies to go at it. If nothing else, it proves that Red River was cleverly designed for extended use and longevity. On the flip side however, the game features a COMPLETE omission of any form of competitive multiplayer. So, for gamers that look to get satisfaction out of the thrill of beating another player to an untimely virtual death, this might not be the game for you. “Stand Together” is the tag-line, and I can’t help but feel that such a declaration can’t help but entice fans of co-op gameplay. Graphically, the game is not what you’d call unplayable. In fact, the rendering on the environments was downright impressive. The game provides a real sense of depth and distance. The player can experience a real sense of being part of something much larger. The wide and detailed landscaping work most certainly works in the game’s favor. The large open areas do provide a strong sense of freedom to choose which direction you want to take, while being kept in the confines of linear mission progression. The environments are immersive, but objects and coloring are a different story. 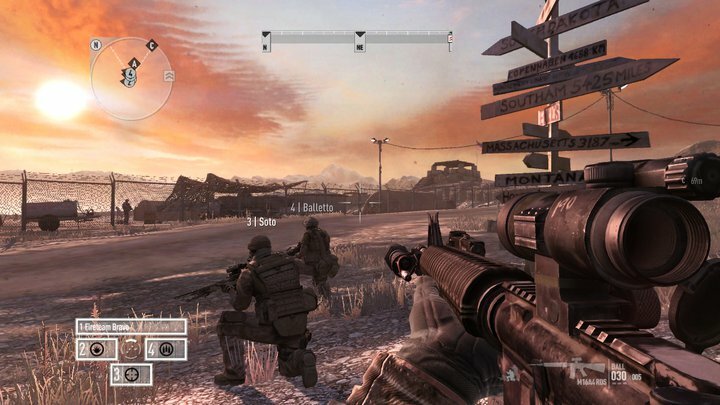 In the opening level of the game, many player will definitely start to get frustrated over the brown smeared color theme that dominates the landscape. Sure the first level is set in a desert, but when almost everything in the visual path is smeared a different shade of brown, combat can become difficult. Lighting features are also highly mixed throughout the game, with some areas being well lit for a fire fight, and other areas being overcast and hazy. It makes it very difficult to differentiate the enemies, made all the more worse by the overly busy HUD display. It’s a commonly known tactic for a visuals in many “realistic” first person shooters to cover many of the color schemes in brown to augment the “real” feeling, but in this particular instance, it’s severely detrimental to the gameplay experience. On the other hand, the soundtrack and voice acting cast of the came really helped lift the mood of the game. War is supposed to be a horrible, depressing event in any human’s lifetime. However, the characters, dialogue and musical score really help set the tone and pace of the game. The sound provides what is essentially the spirit of the game. The voice acting is particularly impressive in the humor factor. Adding an overly aggressive staff sergeant to the character list provides a human like personality to the game. The basic story told by it is this: The allies are here. Enemies are here. Allies are here to screw over their enemies. Although, one issue I do have with the voice acting is in regards to the overly expansive use of military jargon in conversations. As a man who has never served or studied elements of serving in the armed forces, some jargon that appears to be used in-game gets pretty confusing, especially when it relates to your goal or mission. In regards to ambiance in music, the light background music against sound effects really effectively augments the sense of struggle we are used to seeing on the media from the middle-east. By drowning out music with the sound of gunfire, players can really feel what being in a place like this is all about. 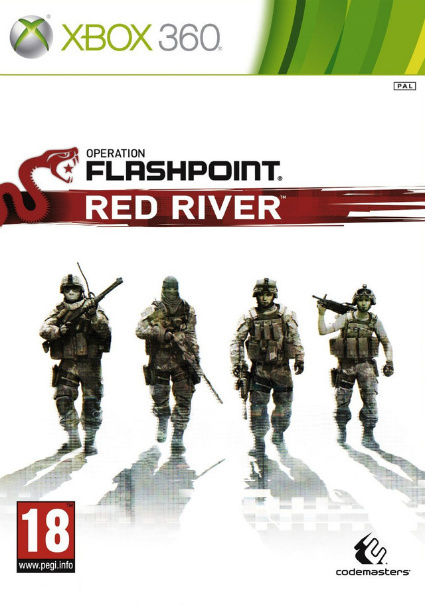 Having played both 360 available Operation Flashpoint games, I can most certainly say that I would DEFINITELY prefer to play Red River over Dragon Rising. The game has improved in leaps and bounds, no questions there, but there are a few minor issues that perhaps should have been reconsidered in the development process. The visual elements are by far the most annoying issues within the game, and at times, controls seem clunky and unrefined. While tactical shooters may be a difficult genre to master, there is so much more that Red River could have been. I suppose what disappointed most was what Red River COULD have been. I’ve played and enjoyed Tactical Shooters like Rainbow Six: Vegas and G.R.A.W, and I can tell that the OF series is attempting to gain similar acclaim, but tid-bit annoyances will keep making gamers compare with more pleasant previous experiences in the genre., there’s a lot that could have been done better, but a lot that was done right too. The only real way to test for sure is to give it a go yourself.